Is playing the Nintendo DS now a miracle cure? Nintendo just doesn't get bad press. 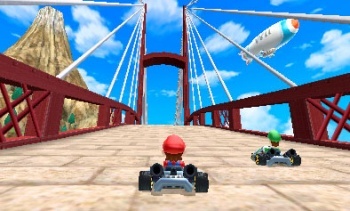 A story has come out of the UK that alleges a child's daily play of Mario Kart on the Nintendo DS helped prevent him from going blind. Six-year-old Ben Michaels has suffered from amblyopia, or severe lazy eye syndrome, from the time he was four years old. This means that the eyesight in one of his eyes had been gradually decreasing, and he is forced to wear an eyepatch over the good eye to help the lazy eye work harder. After playing Mario Kart for two hours a day for a sustained amount of time, his eyesight has reportedly improved 250%. His mother says: "When he started he could not identify our faces with his weak eye. Now he can read with it although he is still a way off where he ought to be." A representative from the Great Ormond Street Children's Hospital explains that playing videogames can improve weak eyesight due to the repetitive eye movement involved, which can increase focus. Not only that, but it's incredibly easy to get children to engage themselves in a videogame. Admittedly, the improvement in Michaels' eyesight could be related to focusing on using his patch more, but there is also likely a "physiological improvement from perceptual visual learning," says the representative. Talk about a story that Nintendo can use for positive PR spin. Not only is the Nintendo DS able to educate children, it can also save them from blindness. And my mother always told me videogames would make me go blind.